Is the bond between mother and daughter unbreakable, even by death? Julia Severn is a student at an elite institute for psychics. Her mentor, the legendary Madame Ackermann, afflicted by jealousy, refuses to pass the torch to her young disciple. Instead, she subjects Julia to the humiliation of reliving her mother’s suicide when Julia was an infant. As the two lock horns, and Julia gains power, Madame Ackermann launches a desperate psychic attack that leaves Julia the victim of a crippling ailment. Julia retreats to a faceless job in Manhattan. But others have noted Julia’s emerging gifts, and soon she’s recruited to track down an elusive missing person—a controversial artist who might have a connection to her mother. As Julia sifts through ghosts and astral clues, everything she thought she knew of her mother is called into question, and she discovers that her ability to know the minds of others—including her own—goes far deeper than she ever imagined. From plot to characterization to prose, Julavits has a mesmerizing writing style, something that makes her particularly well suited to telling the story of a woman with psychic aptitude slowly regaining her talent. The Vanishers is intriguing, unexpected, and difficult to put down. Julia is woefully unaware of the direction her life is taking, in a manner that would be obnoxious in most protagonists. Perhaps it is because of the completely unexpected plot Julavits has introduced. Readers are not often asked to accept a world populated by characters with genuine psychic abilities, particularly in literary fiction. Somehow Julavits manages to put her reader squarely in the realm of suspended disbelief, enough so that even Julia’s nearly aimless wanderings do not grate. Or, perhaps it is the themes of female relationships and the tension and love that can ensue and even coexist that universalizes the story Julavits is telling about Julia’s life, even as most of her specific experiences do not resemble those of the average reader in the least. 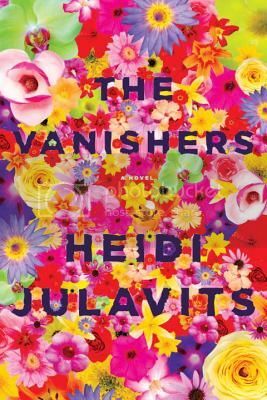 The Vanishers is at times jarring and, as such, is certainly not for everyone, particularly with the threads of suicide, radical surgery, and people going missing on purpose running through it. However, for those willing to approach it, Julavits has magic to work. Highly recommended. This book has piqued my interest, especially since it’s a novel, fiction. Sounds like a good story. I have to say, I don’t love the cover, and I don’t really understand how it fits the slightly dark book. The cover that was on the ARC seems to fit much better, in my opinion. I just started reading this in earnest last night and I’m still trying to find my footing in the world that Julavits has created. Glad to hear that you liked it! The cover art did kind of throw me, with the book description. Oh well, though the surgery parts might give me the willies I really do want to read this one. There is no actual description of any surgery at all, so don’t worry about that, it is more what people are having done to themselves that is uber-creepy. I received this as an extra from one of the Indiespensible months. I’m glad I kept it now.